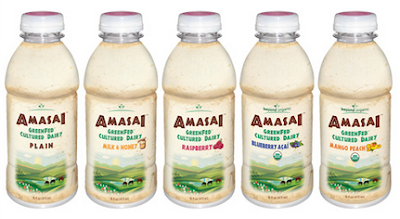 Amasai™ is a cultured dairy beverage from Beyond Organic; true whole milk from Green Fed -no grains- heritage dairy cattle that thrive on greens. This beverage contains a more natural balance and seasonal variation of healthy fats and proteins for your body, with higher levels of fat-soluble vitamins. It provides minerals, and probiotics. Amasai™ is similar to a drinkable yogurt or kefir with a unique makeup of powerful nutrients that provide amazing health benefits. It also contains CLA and Omega 3 fatty acids and can be consumed every day to support your immune system and digestive functions. Launching with 5 flavors: Plain, Milk and Honey, Raspberry, Blueberry/Acai and Mango/Peach. Learn how you can save 20% on all your purchases.